Have I gone completely insane or is there currently a bug with the BoI not "shrinking" when stowed? 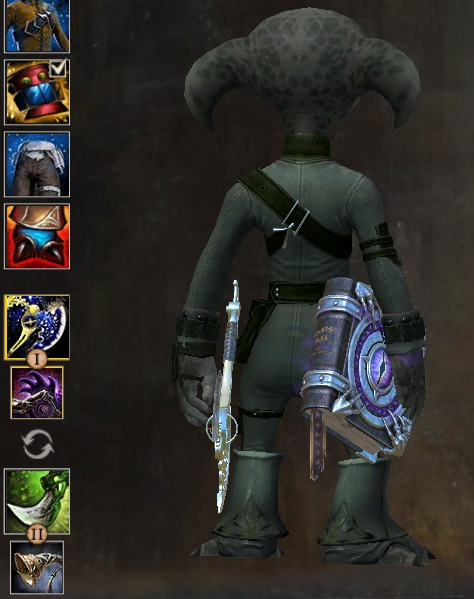 I distinctly remember being happy that it shrinks neatly and thus doesn't clip through my asura's arm when stowed but now it's roughly the same size as it is when wielded (and the character's hand clips through it ). Is this happening to anyone else? I'd test the skin on other races but I happen to be out of transmutation charges for the first time in years. ...is there currently a bug with the BoI not "shrinking" when stowed? 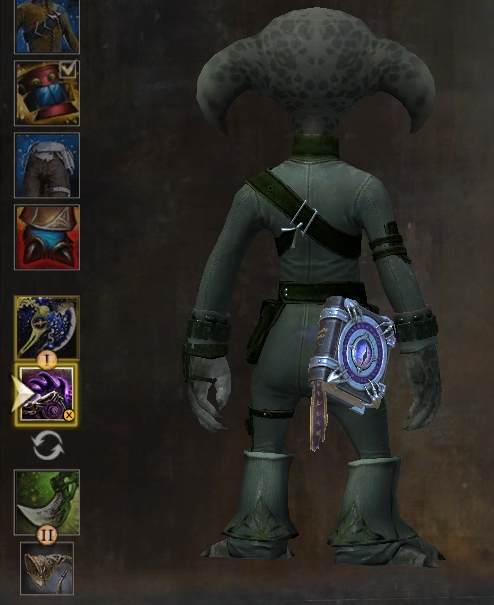 Book is absolutely smaller on Sylvari when stowed. I'll check on my asura and edit my response. edit: shrinks on my asura, too. 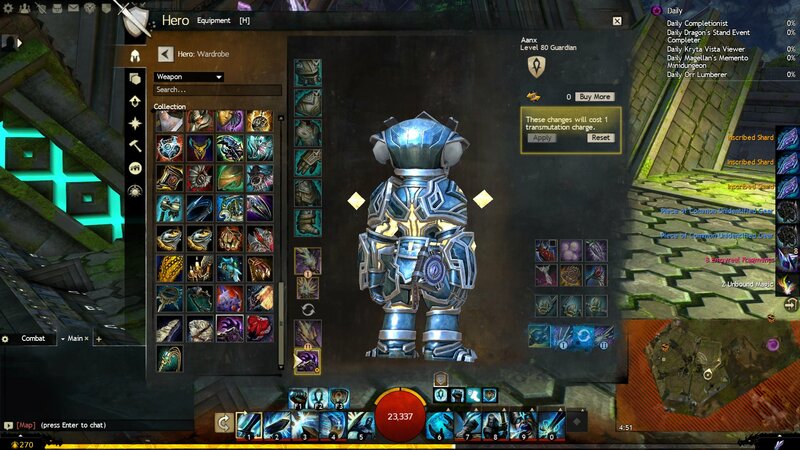 I don't see any clipping on the hand, so maybe it depends on the armor and/or size of the asura. This toon is as small as I could make it when created. 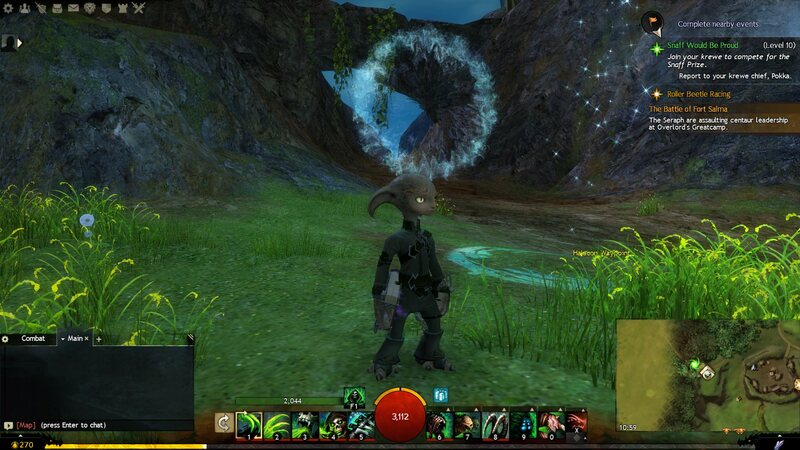 edit 2: also shrinks on my other asura. However, there's some minor clipping with the gauntlets, which are very wide on the particular skin I chose. I wouldn't notice normally; I only zoomed in for a closer look because the OP was concerned about any sort of overlap. I'd test the skin on other races but I happen to be out of transmutation charges for the first time in years. Since it's a legendary, you can just swap it to any other toon that has a profession that uses focus: mesmer, ele, necro, guardian. Based on your screen shot, I'm seeing roughly the same as you. You call it a bug; I call it being able to see a legendary weapon on my asura. If the book was scaled better to the race, it would be practically invisible, like a lot of weapons. And honestly, there are only two reasons I don't exclusively play asura: can't see armor+weapon details and people stand on me when they have social awkwardness (and can't find me if I need heals). I don't actually see clipping in that photo, although the angle isn't idea to tell. That looks almost like the asura's hand is resting on the book, ready to pull it out and read a good story, to help banish a monster. It's definitely more noticeable with some of the heavy gauntlets out there. I hadn't used binding on any of my asura before, so I can't tell if indeed this is a change from before. I can tell you that I'm happy with the current stowed-book size (and I wouldn't mind it bigger still). I watched some old videos and apparently I am actually insane. Or there's a preview bug of some sort that used to make it look smaller when stowed. Never mind then, I guess. When you equip a different focus and preview the BoI skin, the book looks small when stowed. When you actually change the skin or equip the legendary, the book becomes big. This might not be the biggest bug that ever bugged, but it is absolutely not [Resolved]. People preview legendaries before they invest a great deal of time and/or money into making them. False information in the preview IS NOT OK. The 'issue' you reported in the original post is, as you discovered, not an issue: the size hasn't changed since its introduction, as can be seen in the many videos made when it came out. So it's fair for someone to consider this thread as resolved. However, the preview window has long since been problematic. This isn't something new with Ipos; it's been a weak part of the game since launch. The manner in which is shows colors, sizes, even shapes is not necessarily what we see in game. The lighting is specific to the preview window, and I haven't found a spot in Tyria that matches it well. The size of the window prevents some weapons from being seen in their full glory. It's clunky to look at dyes. And there are all sorts of effects that are not represented at all in the panel, plus others that are poorly rendered relative to what they look like in game. In short: what we see in the preview panel has never been what we get. In your shoes, I'd start a new thread. I think you'd get a lot of supporting comments, plus people would mention some of the other issues. From what I'm reading, this is not a bug with BoI. This appears to be a functionality issue with Preview Mode as a whole. If that is correct, then I agree that a separate thread would be desirable. At the present time, stating there is a bug with one item probably isn't as helpful as pointing out there seems to be a difference in view between what's in the game and what's in Preview Mode, particularly since that issue exceeds the view of one particular item.